Flavorful teas are some of my favorite drinks. Having those teas be made from ingredients I can feel good about is of utmost importance. 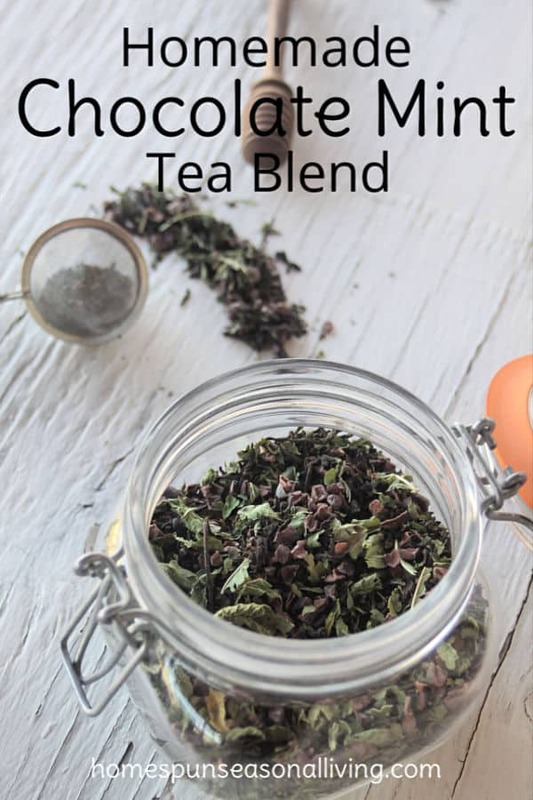 This chocolate mint tea blend is the best of all worlds. As much as I love an all herbal tea, there are times when I enjoy a bit of black tea. It’s important to me that the black tea be delicious on its own. I want the black tea to be a delicious component of the overall flavor, not the overpowering flavor. 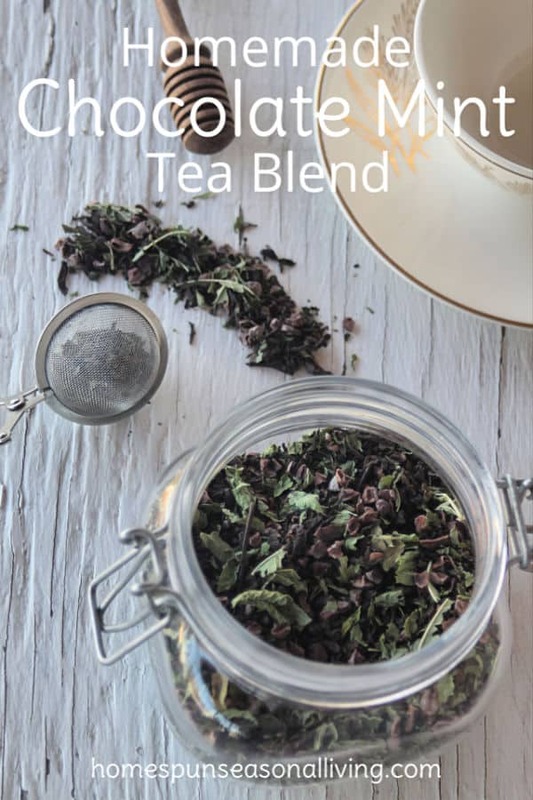 I used Pu-erh tea from the folks at Cup & Leaf in this blend. It’s a perfect compliment without being bitter or overly tannic. Feel free to use any black tea you favor most. Use a decaffeinated black tea for after dinner dessert drinking, if desired. I have a generic ‘mint’ growing in my garden. I dry lots of this particular herb every year. Plain old mint tea is a favorite of mine, but it’s also great in many different blends. 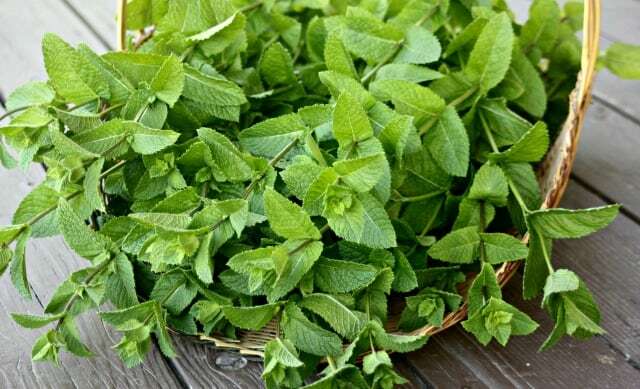 Use whatever mint you might have dried in your own pantry: spearmint, peppermint, that chocolate mint, etc. 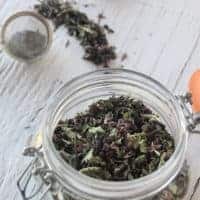 This is a great way to give homegrown herbs to friends and family and have it be just slightly different than a jar of dried herbs (not that there’s anything wrong with that). Cacao nibs are simply bits of fermented cocoa beans. These crunchy bits add a delightful chocolate flavor without making it feel like hot chocolate. It’s slightly bittersweet and a great combination with mint. 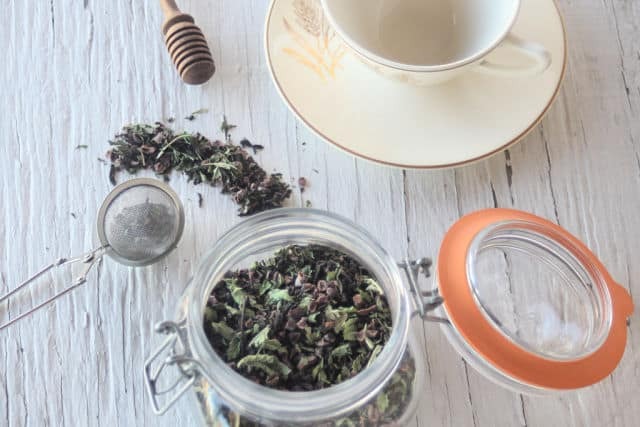 This homemade chocolate mint tea blend comes together in minutes. Simply stir together and put in an airtight jar. For gifts, add a pretty label to the jar. Put the tea in a pretty basket with a jar of honey, a pretty mug, and/or a tea ball for a complete and fun gift for the tea lover in your life. Alternatively, split up the tea blend into individual servings. Seal the individual servings in tea bags and package up 10 bags or so in a pretty tin. For a frugal mailed, care package, simply seal in a plastic bag and mail in a padded envelope with a card. Steep 1 Tablespoon of the chocolate mint tea blend in 8 ounces of boiling water for about 5 minutes. Sweeten with honey or maple syrup if desired. A splash of milk is nice, but drink however you prefer. This truly is a great tea that feels like a treat. Use it for breakfast or afternoon snacking. It’s delicious with dessert. Simply drink and enjoy whenever you’d normally have tea. 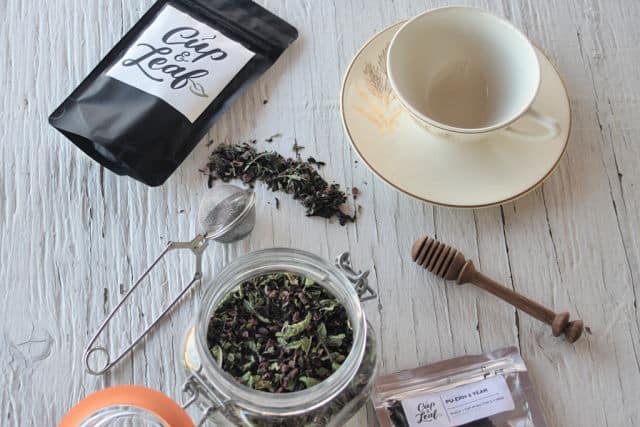 A simple but delightful blend of pu-erh tea, mint, and cacao nibs that makes for a delicious dessert tea and gift. To use: Steep 1 Tablespoon in 8 ounces of boiling water. I imagine you could but I haven’t tested it. I would increase the fresh mint though because it’s not as concentrated as the dry. Something like 1 teaspoon of tea, 2 teaspoons of fresh mint chopped, 1 teaspoon cacao nibs. Let us know how it works for you. Thank you for the good ideas in making tea blends. I like having a variety of teas on hand. You’ve given me some good ideas and homemade tea blends seem to taste better.